Andrew Lincoln is the British actor who plays Rick Grimes for AMC's The Walking Dead TV Series. Lincoln plays a great Rick Grimes and his actions and voice are very different from his real life persona, he really immerses himself into the role. 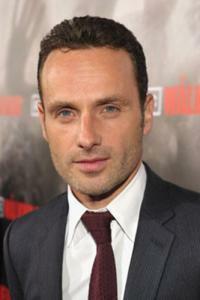 Andrew Lincoln, birth name Andrew Clutterbuck, was born in London, England, UK on September 14, 1973. Andrew stands at a height of 5' 10" (1.75 m). His early childhood was spent in Hull, Yorkshire before moving to Bath, Somerset (97 miles from London and 13 miles from Bristol) at the age of 10. Andrew attended the Beechen Cliff School in Bath, Somerset before attending the London prestigious Royal Academy of Dramatic Art (RADA). That explains the great performances on The Walking Dead and his many other roles on camera. Andrew Lincoln is married to Gael Anderson and his father-in-law is Ian Anderson from Jethro Tull. Andrew Lincoln married Gael on June 10, 2006 and currently has 2 children together.